The Edinburgh Fringe is over for another year, but how did our intrepid amateur companies get on performing plays licensed by Nick Hern Books? 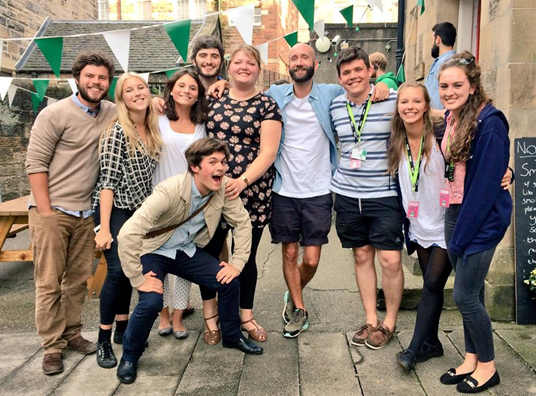 We hear from three of them as they recount the highs – and the lows – of mounting a production on the Fringe. (If you missed the first instalment, it’s available here). The fringe is an experience like no other. 3,314 shows competing for an audience over the 313 venues. It is a challenge to sell a show, regardless of whether you have a ‘name’ or a recognisable brand. So the process of promoting the show throughout the day to the throngs of potential audience members is tough. With a show like Passing Places there is no issue with staying motivated. 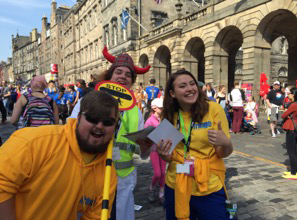 Our team came up with some fantastic ways to promote the show, including going out in character onto the famous Royal Mile to help tourists cross the busy road. The show got respectable audiences each night of our six-night run and a decent 3★ review from the Edinburgh Guide. We were lucky enough to be warmly welcomed by our wonderful venue, Greenside @ Nicolson Square. The venue’s staff and techs were monumental in helping us deliver every element of our production, particularly the Citroën Saxo which sat on stage throughout the performance. 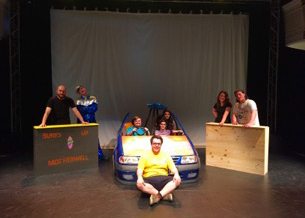 With a 10-minute get-in before each show, and a 20-minute get-out afterwards, it was no mean feat to assemble a car and full set within our slot. Staying to time was key, so it was crucial that everyone played their part to the full. Living together for a week, promoting a show and putting it on is an intense and draining experience, but I wouldn’t change anything about it at all. 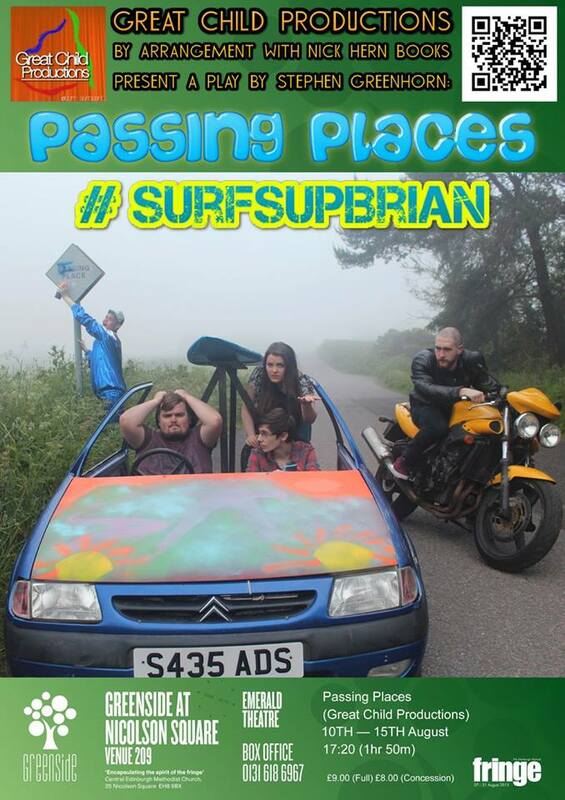 I’d fully recommend it to any theatre group thinking about broadening their horizons and exploring new audiences. 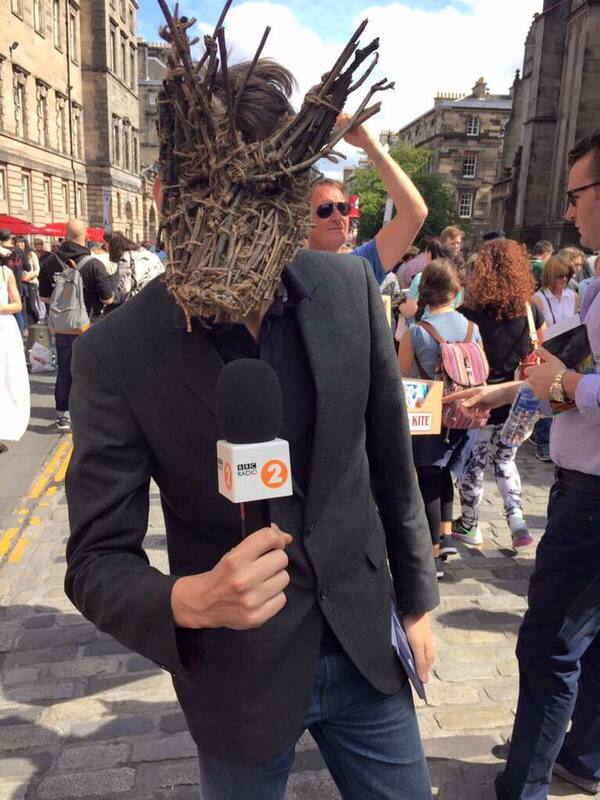 When performing at the Edinburgh Fringe, August can seem like both the longest and shortest month of the year. It’s weird. After the amount of planning that goes into a show (our own preparations for #EdFringe2015 began in 2014), it sometimes feels like you’ll never stop working on it. However, 1st September sneaks up very quickly; it always seems premature (no matter how exhausted you or your company may be). This was certainly true this year. Despite having spent over a month rehearsing and performing in Scotland’s capital, we felt that we were interrupted mid-stride by the Fringe ending. We’d had a hell of a month, though. Highs included receiving five-star reviews, climbing Arthur’s Seat, and our end-of-run party; lows involved some prop-based mishaps (our dead rabbits went missing in a smoking area one grizzly Wednesday evening), and being told to get a job while pitching the show on the Royal Mile. On a Tuesday morning. At 11am. By a man who wasn’t working either. And anyway, we were working extremely hard! Foxfinder, with a running time of 90 minutes, is a big beast to perform, and we were competing with over 3,300 other shows for an audience. In terms of generating audiences, though, we were fortunate to be working with an award-winning script already known to many; we had a strong base on which to build our production. We’re in no doubt that Foxfinder’s reputation was a great starting point for our marketing campaign, and contributed incalculably to the success of the production – as one reviewer stated, ‘The power of Dawn King’s script has already been recognised’. Putting our own stamp on it was another matter, but I think that, ultimately, we succeeded. Well, we are all done! Twelve amazing performances later and we have to say goodbye to this wonderful city and an awesome festival! Both cast and crew have really enjoyed bringing Forever House to life, and the feedback we received, both in person and on social media, was fantastic! All the hours of rehearsals, the workshops, trips and expenses have been more than worth it. And a massive thank you to ‘Phil’ – whoever you are – for our first 5-star audience review! A demanding show like this was bound to have the odd hiccup or two. 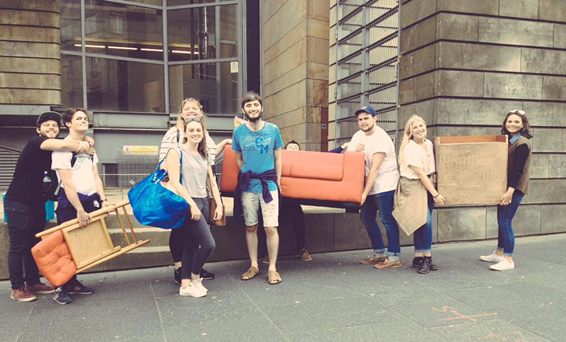 Our particular favourite is probably having to carry our red sofa along the Royal Mile and across town to complete our get-in on time! It’s fair to say it attracted a few odd glances! Furniture seemed to be a recurring issue throughout the process: the production team had to stop itself laughing when our cupboard decided to fall apart during one of the performances! So huge thanks must go to our production team – I honestly don’t know what we would have done without Roisin and Claire. Staying up until 3am every night, sticking reviews to flyers, cleaning the apartment, fixing cupboard doors… there was an endless list of jobs, and our team always had it covered. Forever House is such a clever play, both in that it maintains a simple structure, and yet says a lot about what identity means to people and the importance of ‘belonging’. All the actors worked incredibly hard to bring something fresh and new to each performance, always coming to myself or Freddie (my co-director) to ask how they could improve or what they could work on individually. The beauty of this play is that the awkwardness of its characters comes across so naturally, and a lot of our audience feedback reflected how much work had been put in by all of our cast. The playwright, Glenn Waldron, who was incredibly helpful throughout the process, was kind enough to come and see our final performance in Edinburgh. It was lovely to hear how much he enjoyed our interpretation of his play, and he took the time to congratulate everyone involved. Forever House is a play we remain very attached to, and we will be keeping our eyes peeled for Glenn’s upcoming work. Working with Pentagon Theatre has been an absolute joy, and it has been a pleasure to direct this little gem of a piece. Uncaused Effects: Playwrights on playwriting. In this podcast sponsored by Nick Hern Books, Exeunt Magazine talks to nine playwrights at various stages of their career and at different points of the writing process. The writers discuss all aspects of playwriting, from the first moment of inspiration to the inevitable struggles with the blank page and, finally, to the moment it all takes shape on the stage. Presenter Tim Bano asks what it means to be a writer, and discusses the state of new writing in the UK. And don’t miss out on this special offer on books by some of the playwrights featured in the episode.